This Error Message Article explains the SENTINEL error message “CODESOFT Printing:[msg207] Printer [Printer Name],[Printer Port] does not exist…” and details how to fix the underlying problem that caused it to appear. SENTINEL was unable to process the print request due to a printer error. The error message indicates it cannot find the correct printer. 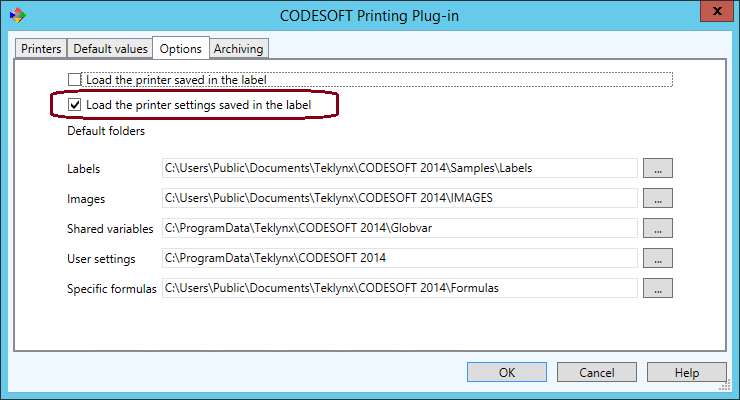 This error appeared when using TEKLYNX CENTRAL and the “Load the printer saved in the label” feature in the SENTINEL CODESOFT Printer Plug-in was active. It appears when this is active, the TEKLYNX CENTRAL preview driver is ignored and TEKLYNX uses the settings embedded in the label instead. If the TC application server cannot find the printer settings embedded in the label, it will fail. The error message above is what appeared in the TCPreview SENTINEL. [08/01/2015] [14:01:14] CODESOFT Printing : [msg:207] Printer ‘,’ does not exist. This time, the error appeared when the printer name had been changed in SENTINEL/CODESOFT but the new name did not update in the TEKLYNX CENTRAL browser interface. We recommend with first looking at the SENTINEL “Load the printer saved in the label” and making sure it is unchecked. If that does not resolve the problem, try dropping the printer with the old name within the TCADMIN screen and re-adding the printer with the new name.